2nd Northumbrian Field Company RE - later changed to 447 Field Company RE. The notes taken from 2nd Lieutenant H.A. Baker M.C.RE. 's book, was also partly prepared by Major Symons D.S.O., M.C., RE, former O.C. of 7 Field Company RE. These notes are in brown text. Maintaining in a usable state of repair the wooden trench tramway. This later was in a very bad condition owing to the mud and broke in several places every night, it was therefore decided to lay a steel track beside the wooden one but out of the mud zone. This was started on the 7th, and was nearly completed at the end of the month. Right Sector (trenches A7- A12 inclusive) Flooring and revetting the front line. Honing and revetting SACKVILLE ST. Reclaiming support point RE. ii. At improving advanced Divisional H.Q. Iii. At making up trench stores in the billet. 2nd Lt Aldin was temporarily attached to the Company from 9.1.16. 1 January, 1916: Dad sent his car and fetched me over to Second Army headquarters for a day. There I saw a doctor who sent me to hospital. This was a trick of Dad's. He knew that I would never willingly leave my company. 2- 24 January: In No 12 Casualty Clearing Station, Hazebrouck. It was as well that I went to hospital. The bones of my toe had been shattered and the wound was full of the splinters of dead bone. It would never have healed until these were removed. When I arrived at the C. C. S., an R. A. M. C. corporal met the ambulance at the entrance and carried my bag into the building. I tipped him sixpence, which he accepted without comment. I discovered later that he was the Earl of Crawford, the Premier Earl of Scotland. Being too old to get a commission, he enlisted as a private in the R. A. M. C., and so got out to France. I don't suppose I shall ever again have the chance to give a sixpenny tip to an earl. These are the men who fought and died, In the ranks of the Deathless Army. 25 January: I was discharged from hospital and spent the night with Dad at Second Army headquarters at Cassel. The nextday I returned to the company rear billet at Vlamertinghe. Where the whizz-bangs and shrapnel they whistle and roar. , I want to go home! I wonder if the Boche intelligence have received copies of this song, and reported that the morale of the British Army is cracking. I walked about for a few days but my foot opened up again, so I took a week more lying up. After that I rode Minx -she is getting fitter and is very handy and pleasant to ride. Since Symons was hit, Atkinson, the second-in-command, a regular captain, has been commanding the company. Atkinson is a very keen soldier. He spends every leisure moment studying Napoleon's campaigns, spreading maps of Austerlitz, Jena or Auerstadt, all over the officers' mess table. (b) Opening up of ruins, important communication trenches viz - SACKVILLE ST, TORR TOP, CRAD CRAWL, ST PETERS ST.
8 Feb Lt Atkinson wounded by shell fire ( right elbow badly shattered) - This officer was at the time was acting OC the Coy. (during absence on leave of Capt McQueen) He had acted OC during the period middle December when Major Symons was wounded, while appointment of new OC. He had served with the Company for 14 months of the war, and the loss of his services was much felt. 2nd Lt Glubb was grazed by shell splinter at the same time but was fit for duty a few days later. Statement of promotions, casualties etc attached. 2nd Lt Chaplain joined on 14 Feb taking over No1 Section from 2nd Lt Glubb. Sgt Frankenberg- Sect Sgt No2 Section. Throughout the month the transport taking stores to Zillebeke (via Ypres, Lille Gate, Shrapnel Corner, Zillebeke, Ypres, (Menin Gate), Krustraat had some "warm" passages but were very fortunate in having no casualties in man or horse. The horses were kept as usual very well, owing to bad roads it was difficult to keep the wagons in good repair. 8 February: Went up to Zillebeke to take over my section agairi, but found that Atkinson had been wounded. His right arm was badly smashed at the elbow. A strafe on our front line has been going on all day. I am now commanding the company till a Captain McQueen arrives, who has been posted to replace Symons, but is now on leave. The principal problem in the Ypres salient is that, during the German gas attack last April, the enemy was everywhere able to seize the high ground, and now completely overlooks our positions and all our communications to the rear. This enables him to inflict continual daily casualties on us by sniping with observed artillery fire. Sanctuary Wood and Zillebeke are overlooked by high ground to the east. In our southern half of the salient, south of the Ypres - Menin road, however, the worst enemy observation points are Hill 60, and the Bluff. Both of these are spoil heaps, but so flat is the whole country that an artificial mound a few feet high constitutes a priceless observation post to capture, which thousands of men of both sides may die. Hill 60 is a spoil heap consisting of earth excavated in the making of the Ypres-Comines Railway. The Bluff was produced by the excavation of the Ypres-Comines canal.The second problem facing us in the Ypres salient is the existence of the Yser Canal, and its southern continuation which runs from Ypres to the River Lys at Comines. There are no bridges over the canal, excepting directly into the town of Ypres. This means that Ypres is a bottleneck for all communications to some ten miles of front line trenches. All rations, ammunition, stores and relieving troops have to pass through Ypres town to reach the trenches and return. As a result, the Boche shells Ypres almost continuously, and especially at night, with seventeen inch howitzers and other very heavy artillery, causing severe losses to transport and relieving troops. And now to return to my daily diary entries. 10, 11 and 12 February: We worked hard day and night to rebuild Gourock Road trench in Sanctuary Wood. Parade was daily at 8 a.m., and we got back to Zillebeke at midnight or 1 am. 13 February: Sanctuary Wood heavily shelled all day. A gas attack is expected. Our. guns seem afraid to reply. In the afternoon, there was a heavy battle at the Bluff to the south. We lost 400 yards of our front line trenches. 14 February: We made a heavy counter-attack on the Bluff trenches during the night. A concentrated bombardment by us was taking place at the Bluff, when we came back from work in Sanctuary Wood at 1 a.m. It was a very fine sight. The Boche kept up a continuous stream of Very lights, in the light of which the blue smoke from the shell bursts could be seen hanging over the trenches, as if the ashes of a bonfire had been raked out. At the same time, orange flashes of bursting shrapnel kept dotting the line up and down. Though it was several miles away, there was a continuous deafening roar of artillery from before midnight till 1.30a.m. Walking home in the night from Sanctuary Wood down Dormy House Lane, I trod on a rat. He was sitting up in the trench watching the fireworks at the Bluff, as I was, so we did not see each other. The roar of the bombardment was so loud that he had not heard us coming, though I had a section of sappers behind me. Unfortunately we failed to retake our trenches. The Boche still hold the Bluff, an observation post which overlooks our lines for miles around. The trenches belonged to the 17th Division who, I believe, are not considered creme de la creme. However they do not seem to be much to blame for losing their trenches, as all the occupants of the front line had been killed by shellfire. Our guns made a most inadequate reply. 15 February: An unlucky day for No 1Section. At 6.30 a.m. a 4.2 howitzer shell fell just by the cookhouse wall, injured Sapper Campion and smashed his treasured violin. At 11 a.m., we were working in Warrington Avenue in Sanctuary Wood, when a salvo of whizz-bangs came over at our party. One shell burst in a bay where the sappers were working, killing Sapper Smith, and wounding Penson and Girdler. Sapper Roles got a scratch on his cheek . Another whizz-bang burst on the parapet of the next bay, where I was sitting on the firestep talking to Corporal Adams. A tiny splinter went through my cap and just drew blood from my head. Penson, Girdler and I were evacuated to Vlamertinghe the same afternoon, whence I got leave to return to Germaine's Farm. The next day Dad, who had heard I had been wounded again, came to see me with a doctor, and took me off for a rest to Cassel. Chaplin, a new officer who had just joined the company, went up to Zillebeke to take over my section.Three days later, I returned to Germaine's Farm, and went straight up to Zillebeke to see our new company commander, Captain J.A. McQueen, who had meanwhile arrived. I wanted to persuade him to let me return to my old section in Zillebeke, but in vain. Since Atkinson was wounded, I am the next senior officer after McQueen, and am to take over second-in-command and work at the rear billet. I would give anything to get back to my old section. 29 February: Tessier came down from Zillebeke sick, so I seized the opportunity to go up and take over No 3 Section for a week. A strafe is expected, as we are about to try and take back our trenches in front of the Bluff, lost on 13 February. A diversion is to be made in Sanctuary Wood, and a smoke cloud released, if the wind is favourable. Worked all night in Warrington Avenue and Centan Avenue. Work in hand continuation of that detailed in February summary, the defences of "CANNY HILL" being the main feature. Nos 3 & 4 Sections in advanced billets in Zillebeke, working with 150 Bde, 1 & 2 Sections in back billets working on defended localities "HO" & "HQ", advanced D.H.Q, shops-in view of anticipated fighting round the "bluff" on our immediate right, our section of line was manned and prepared for any eventuality. 2 days reserve rations sent up to forward sections. No working parties night of 1 & 2 March. O.C. proceeded to 150 B.H.Q for the night in accordance with "defence scheme". 1 March: Infantry took back the Bluff trenches at 4.30 am this morning by surprise. Intense bombardment from 4.32 to 5 am. In Sanctuary Wood, we created a diversion with bombs, trench mortars, and by blowing up a mine, and got heavily shelled in return. We worked all night repairing our trenches without help from the infantry. Heavy bombardment of trenches in neighbourhood of "The Bluff" followed by attack reported as successful. Sector worked by 7 Coy RE came in for considerable shelling. The support line was occupied by the infantry in lieu of the reserve line. This turned out to be of great use as reserve line was heavily shelled. No casualties to sections in Zillebeke. Any shelling there taking the form of shrapnel and 'whizz-bang' barrages only. Work carried out by day as usual not without usual infantry working parties. 3 - 8 March: During this week, we worked continuously repairing the trenches in Sanctuary Wood. A good deal of snow fell, followed by alternate frosts and thaws. Owing to Germans having handled front line trenches somewhat severely of late the battalion in the front line unable to find any working parties for work directly superintended by RE, only work parties obtainable being those from Battalion in reserve. O.C took Major King RE (O.C.104 Coy RE) over the line and handed over all information respecting the work, details of which on the 8/9th arrived. 9 March: Two officers of·104th Field Company came up to Zillebeke to take over, and I showed, them round our trenches. We bade farewell to Zillebeke, and marched back to the rear billet for the last time. How often I have done this wearisome night march at the end of a day's work in the line. We used to have to leave Zillebeke after dark, as the country to be crossed was in view. Then we passed through Kruistraat, a southern suburb of Ypres, where a number of roads intersected and which the Boche shelled frequently. The last part of the march, from Kruistraat to Germaine's Farm, was out of range of ordinary shelling, but by this time everyone was dog-tired. 'It fair breaks your heart, that last bit,' Corporal Adams remarked. Doesn't she look pretty as she hugs the shore, Sailing for -baltimore. Come on, Nancy, put your best dress on! . ..
Perhaps the picture conjured up by such words formed a pleasant contrast to the cold, mud, dark and weariness of a Flanders winter night. 10 March: Sappers are never allowed to rest. We have a new job. We have got the wind up that our trenches at Verbranden Molen (just on the right of our old sector) are. mined near Hill 60, and so we are digging out some old trenches just behind, to be occupied in case the .mines go up. I went up with Chaplin and Baker, to help them start work on remaking Johnson Trench, just behind Hill 60. When Baker and I reached the back of the railway cutting behind Hill 60, the 'overs' from the front line were· coming over quite fast, and hitting into the tree stumps and the ground with a whop. We had several casualties. 11 March: The Boche must have discovered we had worked last night, as Johnson Trench was strafed continuously all tonight. 11 -20 March: We continued the work on Johnson Trench, having two or three casualties every night among the sappers and the infantry working parties. I was up at the work myself, two nights out of three. Sometimes I only went as far as Transport Farm, to see a job on the road between there and Shrapnel Comer. The road here is almost impassable for shell-holes, some of them three feet deep. We have got these "filled with brick at the bottom and road metal on top and have revetted the sides of the pave with logs. and pickets. Apart from a very rough night of shelling on 11 March, things were fairly quiet. On the way to work and back, we were shelled at Kruistraat on 15th, and Belgian Chateau on the 18th. It was all very hard work for the sappers, especially as they had to march there and back every night from Germaine's Farm. We set out each evening at 6 p.m . and got back as dawn was breaking. Nevertheless the boys usually used to sing on the road from Kruistraat to home. We have succeeded in disposing of poor old Sergeant Macey of No1 Section. His name was sent in to be put in charge of a coffee-stall in Kruistraat. How are the mighty fallen! An R.E. sergeant too! But we could not get rid of him any other way. He had been out since August 1914 and was too war-weary to be any good in the line. The joke was that, having been sent to Kruistraat for a quiet rest, the place was shelled to blazes a few days later and his coffee-stall was completely demolished. The old man was lucky to come out of it alive. This is the third week of the Battle of Verdun, with huge events in the balance. The Boches are running this attack on a gigantic scale. The losses on both sides and the artillery preparations are colossal. I believe it was touch and go at the beginning, until a certain General Petain arrived, who is the latest soldier to become famous. I don't think we can say the Boche has no sense of humour. At Loos, for example, we used gas for the first time. This was done with huge secrecy, even the infantry in the line, and the sappers who made the emplacements, were not supposed to know what for. The generals were patting themselves on the back for their cleverness and anticipating the complete surprise which would come off . Two or three days of unfavourable wind preceded the attack. On the third morning, a notice was seen stuck up over the Boche trenches - Wind still wrong for your damned gas! All this frightfulness seems to me regrettable. After all, they are experiencing the same sufferings as we are. If we exchange a few witticisms, it does not mean we are going to betray our trust. We are in this job until we win. But occasional intervals of humour bring brief relief to the savagery. (b) Site of barrier changed by CRE and started again opposite entrance to LARCHWOOD dugouts. W.P. 180 men 7th N.F. Lt Tessier proceeded to Hazebouck for inspection by Med Board. Same as 14/3/16 - (a) Johnson St C.T (500yds) deepened throughout to about 5' 6" in depth, - U framing started. Shell fire on junction Jackson St and railway 7 minute intervals, interfered with carriage of materials - Sapper Wilkins slightly wounded (shrapnel), W.P 100 men 7th D.L.I (pioneers), 50 from 9th D.L.I - V. G. Progress. (b) 1300 sandbags filled and laid in barrier 9' at base bringing it up to height of 2' 6" throughout length. Same as 15/3/16 - (a) Johnson St C.T.- 130 U frames put in & canvas + wire netting erected. (b) 1 & 2 Sections, 1700 sandbags laid, - W.P. 100 9th D.L.I, V.G. Progress. Quiet night on the whole after 11pm. Cutting and Junction Jackson's St - Johnson St shelled at intervals up to 11pm. Same as 16/3/16 (a) Johnson St C.T. - 80 U frames put in & entrenchment - 140yds of C.T now completely revetted. (b) 1000 sand bags filled and laid giving barrier 9' broad at base, 6' at top and 6' high across railway cutting, - V quiet night except for rifle fire on railway. Nos 3 & 4 Sections relieved 1 & 2 Sections in trenches, 1 & 2 returning to billets - except for night of 20/21 work was not possible, halted by shell fire. (a) Johnson street 250 yds revetted, all drains cleaned again, (b) Barrier parados brought to height of 6', barrier itself to 9' - cutting made ready for covered way. 20 March: I went up to the Bluff trenches with the O.C. We are apparently taking them over from the 3rd Division. This is where, in February, all the battles took place which we used to watch from Zillebeke. The trenches are not so bad, but the front line is very isolated and consists of several disconnected pieces of trench, accessible only by night. The 3rd Division have been using three field companies, one fortress company and a pioneer battalion on the sector that we are taking over with our one company alone. The navigable Ypres-Comines Canal crosses the front line at this point, and the Bluff is a long artificial ridge running parallel to the canal, and formed by the spoil dug out to make the canal. It is easy to see the Boche objective in the battle of 13 February. Our reserve line is on top of this artificial ridge, and from it one can see for miles all over the southern half of the salient from Ypres to Kemmel. They just missed this, however, for during the battle it became our front line. The Dorsets, of the 17th Division, were holding the trenches and lost them, every man in the front line being killed. Our dead are still lying in large numbers on the slopes of the Bluff, killed by machine-gun fire during the Dorsets' counter-attack. There was one corpse in particular which became quite the stock thing to show to visitors. He had been killed while climbing up the steep bank of the Bluff, and had one foot raised and a hand stretched out to pull himself up by. By some miracle, he remained in the same identical position. Except for the green colour of his face and hand, one would never have believed that he was dead. We went round the trenches with young Congreve, who was the Brigade Major. He was famous as a brave man, and already had a V. C. and a D.S.O. [He was killed later]. His father had won a V.C. and lost an arm at the Battle of Colenso, and is now commanding a corps. Bravery seemed to run in the family. When we were walking with him in the line, between the Bluff and the canal, he suddenly spotted a broken machine-gun lying in the open on top of the Bluff spoil bank itself. He calmly climbed out of the trench and walked up the slope of the Bluff in the open to look at it. He must have been in full view of the Boche line for miles. Presumably none of the enemy was looking, as nobody would ever have dreamt that anyone would walk there in daylight. Congreve had a great effect on the morale of his brigade. When they were relieved by the 3rd Division, the 17th Division were very much shaken, and were crawling about on all fours, for fear of snipers. The lst Gordons of the 3rd Division came in full of beans to relieve them, and all stood on the fire step at once, a la Congreve, fo look over the top and see where Jerry was. Orders received on 21/3/16 to stop work on Johnson Street and barrier (in RV Cutting by hill 60) and to rest Sections prior to taking up "the Bluff" Sector with 151 Bde on night 23/24. The O.C revisited "the Bluff" with O.C East Riding Co RE on 21/3/16 - this area had lately been the scene of serious fighting viz:- the Germans captured the Bluff and 600 yds front line trenches in February and we retook them in early March - consequently all trenches were nearly obliterated by shell fire on both sides. Much work since recapture done by 3 Div, but much remained to be done. O.C at request of G.O.C 151 Bde submitted on 22/3/16 proposals for working the line viz:- Infantry at front line work and covering RE, cleaning, draining and revetting all important C.T's, Pioneers (2 Coys promised) reclaiming 31S, 30S, 30R and C.T from 30S to 29 - 1 & 2 Sections with 2nd Lts Glubb & Baker on "the Bluff" on night 23/24. 22 March: I rode into Reninghelst in the morning with Baldwin to get some money from the field cashier. Just beyond Ouderdom, we met a Canadian battalion marching to attention, with their band, playing. We rode on and saw a group of brass hats beside the road, with the inspecting officer sitting on his horse in front. We rode by and saluted, thinking it was some divisional general. A bit further on, we ran into an Assistant Provost Marshal! Fearful language! We had to escape across country, pursued by the uncomplimentary epithets of the military police. It turned out that it was Sir Douglas Haig, inspecting the whole Canadian Army Corps. We had innocently ridden past the saluting base in the wrong direction. Work as above commenced with fair progress considering very dark nights and difficulty getting material to site. W.P about 140 men, 8th D.L.I available for all work. O.C went round line with the G.O.C 151 Bde. 24-26 March: Worked with No1 Section in the front line. The trenches have been almost entirely blown in and are in many cases impassable for mud and water. Somehow they have to be reconstructed and dried. Very quiet. Both sides have a lot of work to do. No 3 Section also proceeded to trenches- the work required being more than 1 & 2 at somewhat reduced strength could cope with. O.C. and Lt Chaplin proceeded to trenches, O.C. to stop there some days. 27 March: The 3rd Division, now on our right, did a show at St Eloi. They took three lines of trenches and 125 prisoners. The two battalions of the 3rd Division, who took part, suffered enormously, losing almost all their officers. Such is one of the tiny pushes, hardly mentioned in the papers. The centre of the battle is about 1500 yards south-west of us. The enemy put over a number of whizz-bangs and 4.2 howitzers over here, and also a light shrapnel barrage. When the action developed, however, he left us and turned all his guns on the site of the show. We began the battle by the engineers blowing up four mines under the Boches. The 3rd Division, from whom we recently took over, were running the show. They are always called up to do the heavy work. As usual, we had few casualties in the assault, as everyone in the enemy's front line was dead. But when the trenches were taken, our fellows were bombarded continuously for two days and frequently for the next week. At 12.45 on the 27th, the enemy commenced an intense bombardment followed by bombing attacks up his communication trenches. This was stopped and the enemy never came out over his parapet. The German troops were Saxons. Baker and I have a very nice dugout in the side of the Bluff, built up with mining frames. A duckboard walk passes in front of it. As the Bluff itself prevents the enemy from seeing the path, a communication trench is not necessary. lannel bag you are supposed to put over your head. It had to be carried in a small canvas satchel and worn on all occasions. The general was very keen on this order, and made a great fuss if he saw any man without his gas mask. One day, when going round the line, the general discovered to his horror that he had himself forgotten his mask, so, stopping some passing soldier, he borrowed his and slung it over his shoulder. With a sigh of relief, he entered the trenches and round the first corner, came upon a man who was not wearing a gas mask. After giving the man a severe reprimand, he said, 'I don 't believe you even know how to use one if you had one. Here take mine and let us see you use it - Gas cloud -go!' The general took the little satchel off his shoulder and thrust it into the soldier's hands. The latter, with trembling alacrity undid the button and pulled out - a filthy old pair of socks! Although the duckboard walk leading up the line, under cover of the Bluff, was out of view to the enemy, the open country a little further north was in full view . An unsuspecting person would often wander across this. When he was well out in the open, a Boche machine-gun would open on him. Down he would go on his face and lie motionless. After a few minutes, he would jump up and make a dash for it, but the machine-gun would open again, and down he would go once more. Quite a crowd of spectators used to gather along the ground beneath the Bluff which was invisible to the enemy. They would laugh loudly and watch the fun, shouting out facetious advice. Of course the poor victim himself was sweating blood, thinking that his last hour was come. It seemed extraordinary how callous some people could become. Yet if the man had been hit, several would have run out under the same fire to rescue him. Perhaps their attitude was one of defiance -pretending that getting killed was a joke. I never knew a place like the Bluff for corpses. During the battle last month, the troops, suffered heavily and were too tired to bury their dead. Many of them were merely trampled into the floor of the trench, where they were soon lost in the mud and the water. We have been digging out a lot of these trenches again, and are constanly coming upon the corpses. They are pretty well decomposed, but a pickaxe brings up chips of bones and rags of clothing. The rest is putrid grey matter. It makes me sick. At other times, they scooped out hollows in the rear face of the trench, or in the traverses, and stuffed their corpses into them. There was part of a hat sticking out of the back of one trench, the head inside which still seemed to be bleeding after at least a fortnight. One often sees hands or boots sticking out. In a disused dugout behind the old front line, half a man's head was sticking out. It had been largely eaten by rats. I believe that Hooge disputes with the Bluff the palm for corpse-infested trenches. Hooge claimed to possess a single traverse with six or eight men buried in it. I often wish that some of those brilliant politicians who rouse the enthusiasm of crowds by denouncing other nations, could be brought round here to see what war really is. I had rather a fright one night at the Bluff. We had some men working in an isolated section of the front line, unconnected with our trenches. One had to go to it at night over the top. I set out with an orderly to walk to them over the open, but it was pitch dark and we lost the way. As there was no front line, I thought for a bit that .we must have walked into the Boche line, which a number of people have done before now. For a few seconds I was seized with panic and completely lost my sense of direction. To feel yourself lost is a terrifying psychological experience which prevents all thought. However I recovered myself, but I still did not know in which direction were our trenches or those of the enemy. The Very lights were shooting up into the air from all directions, suddenly shedding a blinding light, and then going out and leaving the darkness blacker than before. I could not tell which were our lights and which those of the Boche. I then suddenly discovered that I had forgotten my revolver! Eventually I made up my mind in which direction, I thought our trenches must lie; and we inched our way towards them in the dark periods between Very lights. I was not sorry when we got back to our trenches again. 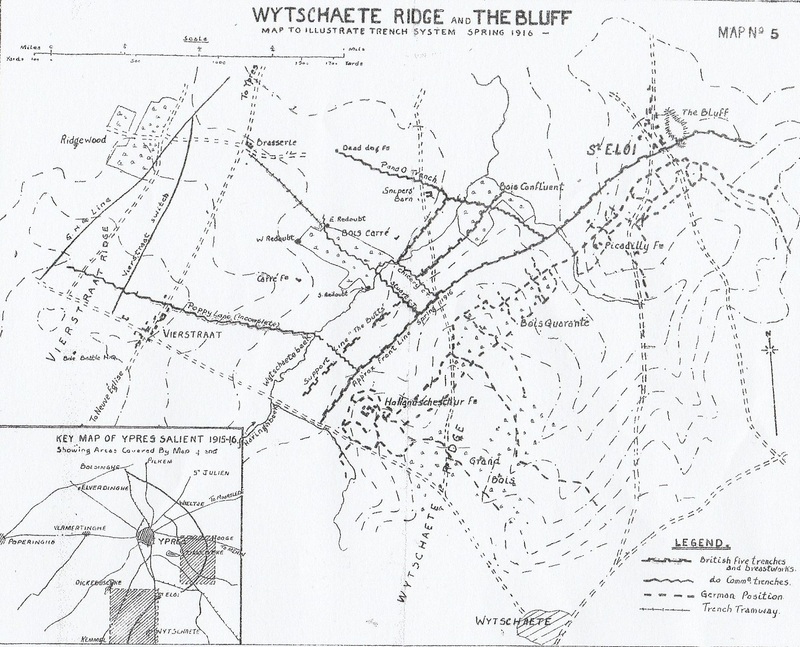 Early in March heavy fighting took place round the Bluff on the sector immediately south of that held by the 50th Division where the Germans sprang a large mine and temporarily gained the Bluff, the mine crater and most of the captured trenches were retaken the following day by the 7th Division and remained in its hands. The 50th Division side-stepped into this sector on the 7th March. The two forward Sections of the 7th Coy (remaining at Zillebeke) worked from the 8th to the 21st on the construction of communication trenches and of a large barricade across the railway cutting immediately opposite Hill 60. Working parties were furnished from the 149th (Northumberland Fusiliers) Brigade, with one Company of the 7th DLI Pioneer Battalion co-operating. 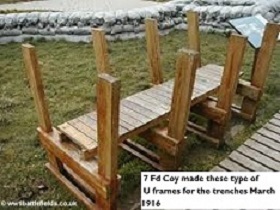 All the C.T.s were revetted with wooded U frames and good progress was made despite the enemy’s nightly harassing fire. Their whizz bangs shooting was remarkably accurate, but casualties were few. The chief enemy was the mud, which was of a particular sticky nature. On the 22nd March Nos, 1 & 2 Sections moved from Zillebekke into dugouts at the North end of the Bluff itself and No 3 Section was sent up to join them. Work mainly consisted of clearing and reconstructing the forward C.T.s destroyed in the recent heavy fighting. These trenches were partly flooded and owing to the numbers of enemy dead, of which the parapets appeared to be chiefly composed and to the torn nature of the ground, the work was difficult and trying. Good all round progress was made in this work and also in constructing the “loop” trench to restore lateral communication in the front line, and in fortifying the far lip of the big crater at the foot of the Bluff. On the night of the 30th the large British mine, opposite St Eloi and one mile east of the Bluff, was sprung. Confused fighting for possession of the crater followed. The next night the sector held by the 151st Brigade was severely shelled. As reliefs were then in progress casualties were heavy. The three 7th Company Sections were however, withdrawn with no greater loss than the destruction by shells of the Dixies and other gear of the two Sections. On completion of "The Wynde" C.T, "Hedge Street" C.T was cut through and entrenched in 2 nights thus reopening coms to "the Loop" (fire trench in front of "The Bluff") It was satisfactory to get this job done before return of Coy-the work being of considerable importance. Credit due to Lt Baker,Sgt Collings and No 2 Section. Sappers Barns and Archer wounded by shrapnel on 1/4/16. O.C reconnoitred with officers of 4th Canadian Field Coy, 2 Div. New line to be taken over by 151 Bde immediately S of St Eloi Sector 15 trenches M.N.O. 1 April: I went over the line south of St Eloi with the O.C. We are taking it over for a short time from the Canadians. Absolute peace! A beautiful front 1ine, clean, dry, full of dugouts and without a shell hole within a mile! One thing is that three months in the Ypres salient makes all else seem to be a paradise. 2 April: I went over the line again with a view to taking up No 3 Section on 4 April, Tessier having been evacuated sick and not having been replaced as yet. I am supposed to be second-in-command, and to run the mounted section, but I have scarcely seen them for three days on end. I have been in the line all the time, commanding sections of sappers, owing to the shortage of officers. In the evening, I rode into Poperinghe on Minx, had tea and bought some papers. One does not realize what a desert the shelled area is until one returns to a real populated town -and sees women in the streets. It does one a lot of good and I enjoyed it very much. 4 April: Marched with Nos 3 and 4 Sections and Baldwin to our new advanced billet about three-quarters of a mile south-east of Dickebusch. The inhabitants were still hanging on in Dickebusch, or some of them at least. I had trouble with a farmer who seemed to be pro-German. Eventually succeeded in patching up an old barn for the troops and putting up a bivouac for us. 4 - 8 April: Worked with No 3 Section in Bois Carre, mostly at night. There was a battle still going on at St Eloi on our left. There is a lot of strafeing day arid night at St Eloi, but not very much on us. A good many wounded kept coming past from the mine craters at St Eloi, through the dressing station at Ridge Wood. These battles sometimes upset the whole front for weeks afterwards. We never can let well alone, but must upset every quiet sector by our 'offensive spirit '. I expect our ·present front will be ruined before long. The Canadian communication trenches are wonderful. Some of them are several feet deep below the trenchboards which makes them quite dry. What a change after Sanctuary Wood or the Bluff. These lovely trenches, however, supply their own little humours. The duckboards are all supposed to be nailed down on transoms, but many are not, so if you tread on one end, the other end gets up and cracks you on the back of the head . This adds to the humours of the infantry carrying-parties with loads of trench mortar bombs going up at night! A combination of vanishing trench boards under one's feet and gunner telephone wires, criss-crossing the trenches on the level of one's nose, gives rise to some wonderfully picturesque language. Nerves are a curious phenomenon. One night I was going up to work in the line during the period we were south of St Eloi. It was a cloudy, cold, grey dusk, and I was walking at the head of the section. The guns were banging away all round, and the flashes lighting up the country. A staff officer called out, wishing us good luck, as he passed down towards the rear. I felt cold and frightened, but,in actual fact, we had a quiet night. Although so quiet at the moment, these trenches are by no means satisfactory . The Boche is above us, and the whole of our lines as far back as Vierstraat are hopelessly overlooked. The bottom of a valley was just behind our front line and was so wet that no trenches could be dug in it. The front line in N and 0 Trenches was only a breastwork with no back. The line had always been so quiet, however, that no one had done any work to improve it. 14 April: I got my first leave. Dad sent a car to fetch me from La Clytte to Cassel. The same morning the car in question had been used by the army commander and his flag was still flying on it:' As a perfectly good second-lieutenant, I could not understand why the field officer's guard turned ·out and presented arms as I drove through Cassel! Two days after I landed in England on leave, I developed appendicitis, and was sent into the Army Hospital at Millbank, where my appendix was removed. to France. I hastened to Aldershot to await posting. Continuation of work detailed above. 2nd Lt Thompson joined from England vice 2nd Lt Tessier invalided home - put i/c No3 Section. Work a good deal hampered by the both the Canadian Bde and 151 Bde reliefs. Work on Grenade stores held up for want of fittings for steel futons. During these days frequent attacks and counter attacks on St Eloi crater led to much barrage and other various arms shelling of our line. No RE casualties but work somewhat interfered with - P.O C.T & 04 trenches received particular attention. Nos 3 & 4 Sections relieved of front line by Sections 1 (2nd Lt Chaplin) and 2 ( 2nd Lt Baker) - about this time the enemy began to shell the M & N trenches very heavily and consistently doing great damage. As on 16th, the question of ditching other work and starting a S.L behind M & N came in for consideration, evening of 17th orders received from the 2nd Army, start this work at once. Work on support line behind M & N trenches also work on reserve line. One and a half Companies 7th D.L.I Pioneers and 100 infantry put to work on support line behind M&N trenches. Work on reserve line dropped for want of men. 1.1/2 Companies 7 D.L.I (pioneers) and 100 Infantry put on support line behind M&N where breastworks (2 complete) were shelled at eight places at about 80 yard intervals. The whole line ? as about 80 yards distant from front line and immediately commenced throughout its length from Bois Quarante & Hollandschur. Full moon getting up about 9pm when 3 machine guns turned on works parties but good progress made. The G.O.C sent up 4 more Lewis machine guns to deal with nuisance of Bosche machine guns. Works from effect five nights work as Pioneers not infantry working parties received late (after relief) and little done particularly as moon was bright and shining clear, and plenty of fire. No working parties available due to Bde being withdrawn (2 Battalions) hut work continued by pioneers. About 9.40pm enemy shelled the whole support line work with 4,2, 5.9, whizzbangs + m.gs consistently at intervals during the night rendering work impossible. No 3 Section withdrawn to La Clytte. No1 Section worked on various works returning early morning 22nd. O.C and officers of Cheshire 7 Co taken near the front line during the day. Cheshire advance party went up by night. During period 16-22 back work (1 & 2 Sects) consisted of (a) completing Grenade stores at Sector "PEABERG" also (b) work on 2 water supply schemes. Coy marched 10am to near MONT DES CATS for rest period with 151 Bde, having been continually employed in the Ypres Salient since Nov 1915 - Coy well deserved a rest. Many changes during this period. Four casualties suffered.New billets in university N of Mont De Cats. Mainly camp fatiques. Training programme drawn out for 2 weeks training - 1st week mainly drills, 2nd week - field works and route marching. - visit from the CRE. Coy in rest at Mont des Cats training and overhaul of equipment. Wiring, bridging (trestles) demolitions, drills. Successful sports and football league (won by 4 Section) were held. Coy marched into billets near La Clytte for work on "Vierstraat Switch"
The work on the support line was divided into 3 sectors - Left sector P&O trench to Chicory C.T.- No 1 Section (2nd Lt Chaplin) - Centre sector Chicory C.T. to opposite No 2 trench. No 2 Section (2nd Lt Russell) Right sector - opposite No 2 trench.to Vierstraat - Wytschaete road, No 4 Section (2nd Lt Baldwin) - The policy was to clear old mined Support Line first throughout to make it a fightable fire trench 4'6" depth, then to cut new trenches required about 600 yards, finally to revet the whole with U frames and complete the building of - on the nights of 9/10. 10/11 good progress was made all arrangements working satisfactorily, for the handling of the large butts - working parties (500-600 a night). On the 11th the fine weather broke & 11-15 continuous heavy rains day and night caused much trouble. Most of the Support Line under clearance fell in where not revetted, and the communication trenches which were being pushed through to facilitate carrying of materials also fell in or filled with water. This entailed at least 5 to 6 days delay. The work also necessitated revettments being put in hand before the new lengths of trench were dug. Apart from the above on Support Line and Communication Trenches other work in hand at this period consisted of making rear Brigade Battle HQ in neighbourhood of Hallenbast Farm. (No 3section 2nd Lt Thompson) certain brick observation posts (this work handed over to the Cheshires about the 8th, making really strong dugouts for M.G.s in Front Line. About the 15th the enemy appeared first to notice the new work (which being well camouflaged from the Hollandeschur Salient and from the Bois Quarante Salient) was inevitable, and heavy machine gun fire was brought to bear nightly on the works and its approaches with the exception of Cpl Greenstreet (killed on the 9th) and 3 infantry works party wounded no casualties suffered during this period, which was extremely lucky. The loss of Cpl Greenstreet, a most capable NCO (No 2 section) was severally felt by all ranks. On the 17th the weather should signs of improvement. During this period work was continued on the new Support Line and adjacent C.Ts under the same organisation in 3 Sectors. On the 20th No 3 Section (2nd Lt Thompson) replaced No 1 Section (2nd Lt Chaplin) working the Left Sector on the nights 22/23/24 some 600 yds of new line was completed thus having the complete line "through" as required. Heavy rains continued for days thus impeding work a great deal. Parts of the support line of Wytschaete Beck was in low lying ground and the type of soil made it difficult to drain. Working parties were on the whole front, Sapper work was well done despite many difficulties. Hostile M.G fire was consistently fired at carrying parties who had to carry materials over the open for 800 yards and their tracks was easily spotted by the enemy. A battery of 150 bde (5 D.L) was sent up for work on the Support Line furnishing 400 men a night (150 used to carry materials) The Sector on the extreme right (No 4 Section) was particularly difficult to work owing to the very wet low lying ground. The lack of C.Ts or any means of transporting materials with transport meant that materials had to be carried over the open up to 1600 yds. The work of constructing "Poppy" Lane C.T. (a most important C.T.) was carried on by A & D Coys 7 D.L.I. (pioneers) under RE supervision. As far as the Wytschaete Beck 800 yds, it was necessarily drained down its length-water difficulties made the work slow. From the Beck to the front line the trenches passed through a low lying wet area. Average RE & infantry casualties on Support line were about 4 nightly. As 3 sections necessarily employed on work on Support Line it was impossible to arrange any satisfactory system of relief. Pioneer Shaw Killed on 23rd (shot). During this period No 1 Section (2nd Lt Chaplin) was employed on constructing 3rd Bn Battle HQ and also 2nd Bn battle HQ. Marking out and mending paths and tracks. On the 4th April the Company marched to hutments at La Clytte and commenced work with the 151st Brigade in the sector immediately opposite the Grande Bois (Wytschaete Ridge). Two and later three sections were moved up into shelters in Ridgewood (one mile north of Vierstraat). The Company was destined to work on this sector from now until the end of July, with the exception of two welcome periods of rest 23 April-11 May and 21st - 27 May. This proved to be one of the most testing times experienced by the Company and contains features of marked interest. Description of the task and its performance is, therefore, given in some detail. The front line held by the 151st Brigade consisted of a continuous sand bag breast work and parados (1,600 yards in length), with shelters built into its reverse side. A small stream - the Haringhebeek ran through low lying marshy land 200 yards in rear of and parallel to the breastwork. Trench communication had as yet only been established with the extreme northern flank of it by means of a single C.T. running from Brasserie on the Vierstraat Ridge through Bois Carre. The whole length of the front line breastwork and the entire ground between it and the Vierstraat Ridge in rear was overlooked from the enemy’s positions on the forward slopes of the opposing Wytschaete Ridge. In the breastworks was a deep mine, one of a series of six constructed along the front of the Messines Ridge a much coveted position by the 11th Army and eventually taken by it in June 1917. Hitherto the enemy, who was working hard on his own defences and wanted to be left in peace, had treated the long exposed breastwork kindly, but the springing of the huge mine at St Eloi - whose existence he had not apparently suspected put a very different aspect on things and henceforward the enemy did his best to hinder in every way, the work of deep mining in this sector and all other works threatening his occupation of the Ridge. Shortly before the 50th Division relieved the Canadian Division on this front the breastwork had been heavily shelled and flattened out in several places. Altogether the picture in this sector was not an attractive one. The Canadian Division had put in hand a C.T. running from the neighbourhood of Vierstraat (1700 yards in rear) called “Poppy Lane” in order to effect communication with the southern flank of the breastwork, but shelling had caused falls and consequent flooding and the C.T. had to reach and cross the difficult and marshy ground near the Haringhebeek. Its continuous revetment throughout was entailed. The capture of the Messines Ridge in the summer of 1916 was contemplated and the rapid development of good communications, of works giving cover to assaulting troops, supports and reserves, and of works protecting the deep mines, was considered urgent. After thorough reconnaissance by divisional staff, C.R.E. and Brigade staff it was decided that the existing breastwork was to be remade and strongly wired, that a support line was to be constructed parallel to it, about 150 yards in the rear, that the C.T. “Poppy Lane” was to be carried through and a fresh C.T. constructed from Bois Carre to the front line (this C.T. was later named Stuart C.T.) Numerous dugouts, shelters and shell slits were to be added to the defences of Bois Carre for the accommodation of support troops etc. The organising and carrying out of these works (other than work in the front line breastwork itself) fell to the 7th Field Company, large working parties of 100 and the assistance of a Company of the 7th D.L.I. Pioneers. As had been anticipated, the construction of some 1.200 yards of exposed support line (half-breastwork on account of water lying at 2’ 6” below water level) proved difficult, as the whole was clearly visible and enfiladed by the enemy. His six machine guns in the Grand Bois and Hollandeschur, assisted by heavy trench mortars and well placed rifle batteries, were scientifically used to frustrate the scheme. In addition, every bullet aimed at the front line and going over the breast work went over the working party at a dangerous level. This entailed work being carried out simultaneously at many places and the support line soon had the appearance of a long row of lengthening grouse butts. These were at once most appropriately named “the butts“, and soon acquired an evil reputation. The working parties, mainly furnished by the reserve or ‘resting’ Brigades at La Clytte, soon looked forward to a return to the comparative comforts of their unhealthy front line. Revetment with U frames darkened with creosote, was adapted. Carriage was mainly overland and tracks soon became visible to the enemy, whose machine guns and rifle fire batteries made the operation hazardous. Altogether the casualties amongst the sappers and the working parties averaged double figures nightly for some weeks, a fact which caused both Divisional and Corps HQs to consider matters carefully from time to time. The importance, however, of the ultimate objective - the capture of the Messines Ridge was the overruling factor and the work was carried on despite difficulties. By July, when the Division was again relieved by the 4th Canadian Division, the work was within sight of completion. Relations with the infantry working parties was excellent throughout, the latter realizing the difficult task the smaller engineer sections were performing as a nightly duty for many weeks without relief. The appreciation of their work expressed from time to time by Brigade and other commanders greatly encouraged all ranks of the Company, many of whom were feeling the continual strain of night work under these conditions. By the middle of June the enemy’s machine guns in Bois Quarante and Hollandscheschur Farm, which enfiladed the support line work from both flanks, became so effective as to make work almost impracticable. To meet these, two sections of field guns stood by throughout the night and by means of a system of lamp signalling from the front of the breastwork, were able to send a salvo at once in the neighbourhood of any machine gun fire, and repeating salvos as long as necessary. This prompt form of retaliation proved very effective probably owing to the annoyance this caused the German working parties in the particular neighbourhood. After receiving a few such salvos an offending machine gun would generally keep quiet for 20 minutes or more. This arrangement was kept going for some weeks encouraging the working parties and greatly improving matters except on misty nights when lamp signalling failed. An unusual incident occurred one night. A certain NCO received a bullet through his cap and it eventually made parting through his hair without more than scorching his skin. The NCO was quite unconcerned and carried on as nothing had happened. During this period the Company lost one officer (2nd Lt Russell D.C.M.) and 9 O.R.s wounded, losses which, though heavy in fact, appeared numerically to be extremely light under the circumstances. 2nd Lt H. Russell DCM,. Russian Order of St George was killed by machine gun fire on the night of 12th July near Stuart C.T. a particularly difficult bit of work he had just completed. His loss was deeply regretted by all. He came out with the Company with the rank of Sergeant in 1914, became CSM in December 1914, and RSM 50 Division RE in July 1915. On being commissioned in May 1916, he was again, by request, posted to the 7th Field Company. He did excellent work throughout. His gallant conduct and cheery disposition coupled with strong personality and all round efficiency endeared him to all. Engaged on difficult work he inspired the working parties with confidence. Although he only worked with the 151st Brigade for a short time, all Battalion commanders of that Brigade took occasion to express their sense of loss incurred. Another markedly severe loss to the Company was that of Cpl W. Bromley of No 3 Section, who was killed on 19th July. This NCO had also served with the Company in the field since August 1914, and was conspicuous for marked ability, coolness and devotion to duty. Two breathers experienced at Mont des Cats were spent in an excellent farm billet just north of the monastery, and were devoted to close order drills, general overhaul, route marching and football. An excellent afternoons mounted sports was carried out, somewhat different to the detriment of the farmer’s best pasturage but, as the attendance of himself and neighbour had been invited and all evidently enjoyed the show, no question of “degats” arose. The Divisional RE (with 3 players from 7 Coy) won the 50th Divisional football league. During this time also, Brigadier General J. Shea C.B. D.S.O. commanding 151st Brigade, came, at his request to see the Company and expressed his appreciation of the work done by it whilst working in affiliation with his Brigade from June 1915 to May 1916. General Shea spoke in warm terms and the Company was much gratified by his action. The C.R.E. (Lt Col C.W. Singer D.S.O.) also formally inspected the Company on 29th April. On the 23 May the Division was inspected at Fletre by the G.O.C. 11TH Army (General Hubert Plumer) when second Lieutenants Baldwin and Russell were presented with D.C.M. Sergeant F. Armstrong, Section Sergeant Mounted Section, became C.Q.M.S. on 30th May, Corporal T. Church becoming Mounted Section Sergeant. Both these NCOs were later awarded the meritorious Service Medal. Nos 3 & 4 Sections were being relieved by Nos' 1 & 2 Sections on 22nd but orders received on 21st to march to billets as shown in column 1. All work on line M-O trenches handed over to 4 Canadian Field Company RE on night 21/22. Marched on 22nd Instr: 1 and 2 Sections to advanced billets, 3 and 4 Sections to Dranoutre. Line C1-D4 handed over by 96 Field Coy RE on 22nd but this Coy - had only been two days in line hence no real information available and task not really started till the nights 24/25th. 5 August: I received my embarkation orders unexpectedly and had to leave in a hurry without saying goodbye to Mum. I reached Southampton at 4 p.m. and crossed the same night on an old transport ship. On board, passages , stairs and deck were a mass of sleeping men. Reached Le Havre at 1 a.m. and, at noon, steamed on up the river Seine to Rouen. The river is quite pretty on the way, the banks in many places falling almost vertically from the tops of the downs to the stream. These steep hillsides are mostly clothed with woods, while little villages nestle in tiny valleys running up from the river. Others stand at the foot of the hills on an artificial quai, which separates the houses from the water. It being a Sunday, all the inhabitants were walking about in their best clothes, and cheered the ship loudly as we went by. Vive L 'Ahgleterre! Heep, heep, hourra. Are we doonarted? and so on. All of which seemed to be most meritorious enthusiasm at what must have been to them a common sight for the best part of two years. We reached No 4 General Base Depot at Rouen at 7 p.m., and I was given my orders the same evening to go on to the 7th Company the next day. 7 August: We left by train at 3.30 p.m. Four of us in a compartment, but one of us having a camp bed, we erected this down the centre, and laid out our blankets across both the seats and the bed. By this means, we had a fair night, and, the weather being warm, a much better journey than last November. Detrained at Bailleul and got a bus to Fletre, where I saw the C.R. E., Colonel Singer, sitting at the open window of a house, and went in and had some tea with him. A message was sent to the company for horses for me, but, getting impatient to rejoin the company, I borrowed a push bicycle and arrived, pouring with sweat, at their billet at Mont des Cats (pronounced by the troops 'Mondycats'). The division has just come out of the line at Kemmel. The Coy marched at 4.15 am to Montes des Cats (same billets as occupied in May 1916) via Mont Rouge, Mont Noir over steep hills which gave a good test for team sport. arrived in Mont des Cats 7.45 am. 8 August: Company drill in the morning. In the afternoon I took a ride with Baker. Dad also looked in for a couple of minutes. The following are now the officers of the company. O.C. -Capt J. A. McQueen R.E. This place is really extraordinarily beautiful. Like Cassel, it is a high steep hill, rising suddenly from the dead level plain of Flanders. It consequently has a tremendous view. Its sides are covered with little farms and cottages, sunken lanes, fields with high shady hedges, and big trees. The summit is crowned by a big Carmelite Monastery and, beside it, a windmill. Morning practised rapid wiring, practised rapid bivouacing. Interpreter M. Rimboy (late with 82nd Field Coy) posted to unit by CRE. 2nd Lt A.M.Glubb rejoined from sick leave at home and took over duties of acting Captain. Training programme received ordering entrenchment of 50 DIV. 9 August: Dad came over and fetched me away after lunch in the car. I had a ride with him after tea, and then back by car next morning, as we are just off down to the Somme. Coy on this date up to strength as regard all ranks and horses. A pair of bicycles not yet replaced (though under demand a long time) otherwise all stores complete. Lecture by O.C. in morning reference employment of RE in attack. Afternoon cricket match versus R.A.M.C. Monte Des Cats. Lost by a few runs. 10 August: Marched down to Godevaerswelde station and entrained at 6 p.m . The officers then went into the village to partake of a dinner ordered by Rimbod, our new interpreter. They went without telling me and I did not know to what inn they had gone. At this moment, the Railway Transport Officer came running up to say that the train was about to start instead of at 9 p.m. as we had been ordered. I despatched messengers right and left and eventually discovered them myself. We all ran back to the train which started a few minutes later. It was pretty cold in the train, though we drank white wine at intervals out of a bottle to warm us up. Inky , Pinky , Parlez-voo? The country here is very like Wiltshire, rolling downs with little copses on top of them and open bits of downland dotted with thorn bushes. There are distant views of country like a patchwork quilt, laid out in squares of golden corn, pasture, plough and woodland, with the sunshine and cloud shadows passing over them. The valleys are full of tall trees and little villages. Bois Bergues is picturesque, but rather dirty and desolate, no neat cottage gardens, and a good deal of tins and army rubbish lying about. The people here are French, not half-Flemish as in the north. We are now in 4th Army, General Sir H. Rawiinson. Baker and I went down in the evening and bathed in a little ditch outside the village, in three inches of water, a difficult job near a main road. At 8 p.m., the 50th Divisional Ammunition Column arrived, very hot and dirty, and pushed into our camp. They are a very ill-disciplined unit. From eight to ten p.m, a fearful argument with them, some of their people having walked into the camp between our wagons and horses , parked their wagons there and bivouacked. I behaved badly then, telling off gunner N.C .O. 's and men thinking myself rather fine. What harm their lying there for one night, as they had already got in there? Entrained at Godewaersvelde Station at 5.15 pm, destination Candas Station. Entrained quickly, good loading parties. Detrained Candas 2.30 am. Took nearly 2 hours to unload vehicles. The accomodation very bad, marched 5 am to Bois Berghest then bivouacked. No casualties to horses during the march. Drill (close order) & route march for sappers, long exercise for horses. Visit from CRE. Received orders to march on 15th with 149 Bde, route march in morning, heavy wind in afternoon. 14 August: Marched out of Bois Bergues at 3.30 a.m., after having stables at 2 a.m. in the dark. The whole division is moving and concentrating towards the south. When units are billeted around in fields and villages, the staff names a starting point, such as a certain church, and gives every unit a time to pass it. The O.C. of each unit works out how long it will take him to march from his bivouac to the starting point , and orders his own parade accordingly. A bad unit will start packing hours before a good one and yet will arrive too late at the starting point. To do this perfectly and in the shortest time is the art of ·a good O.C. and an efficient unit. watched open-mouthed. The officers' mess was in the kitchen of a small farm house, unfortunately shared with an octogenarian gentleman, who crouched over the fire, spat continuously, and ate some white substance off a knife. Baker and I are in the Chateau tonight (Baker having a llotted the billets! ), and we have sheets and beds! The owner, Monsieur Lallart de Lebucqiere, seems to be a gentleman of the old school, judging by his low bow when he met us in the garden. He took off his hat and begged pardon half a dozen times, when he wanted to ask me what corps we belonged to. The French do not today seem to me a very polite people , so it was interesting to find an ancient aristocrat, who still believed in toujours la politesse. Marched 3.30 am to Wargnies via Auteux-Fienvilles-Naours, joined up with 149 Bde at "Sterling Point" (81/2 mile from Bois Bergues) which was reached 5 mins before schedule time. Distance 13 miles, no man fell out enroute though 5 "sick" men marching. Outbursts of heavy rain brought men in from bivouacs. 15 August: Left Wargnies at 9 a.m. and marched eight miles to Mirvaux. The whole division is concentrated now, causing frequent long checks on the march, which make them twice as tiring. The villages down here are all carefully organized for billeting, each house being numbered and having its accommodation in officers, men and horses written up on a board. There is a Town Major in charge of every village. There are also public drinking troughs for horses at intervals. Rimbod, the Interpreter, bought us some bottles of champagne in the village for dinner. I think No 2 Section had some too, as there was great singing and shouts of laughter in the street outside, where a party of the boys seemed to be engaged in throwing water at one another. They responded with the most marvellous smartness when Corporal Collins called them to attention, when an officer passed. We all bivouacked in the fields for the night. Marched 9 am to Mirvaux via Naours-Thelmas-Septenville- distance 9 mile. No man fell out on march- 3 or 4 sore footed men. Reached Mirvaux 12.15 pm. Good billets. Received orders to march following day with Bde to Henencourt but later received orders to proceed to Franvillers marching with Bde as far as Bethencourt. 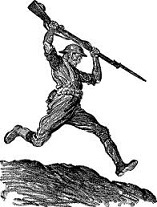 16August: Left Mirvaux at 5 a.m. and marched via Molliens-au-Bois and Montigny to Franvillers. It is rumoured we shall be here ten days or so. At night, the distant rumbling of the guns can be heard. Left Mirvaux-5.45am through Pierregot-Ans-Bois-Montigny-Behencourt. Distance 12 miles, no man fallen out. Reached Franvillers 10 am-town full of troops but few billets. Town Mayor placing infantry of 34 DIV elsewhere to make room for the Coy. 5 tents loaned by Town Mayor. During this period the Coy was employed purely on "training" consisting of making strong posts (cruciform pattern), rapid wiring, deep dugouts, sappering, physical drill, route marching. Useful 10 days work in many ways. Orders received on 29th to move to E of Becourt on the 30th to work under C.E.III Corps. Transport paraded for inspection on 29th by G.O.C 50 Div, but was cancelled owing to bad weather. A very good turnout by our Sections. 18 - 30 August: In Franvillers. The whole division, including ourselves, are well up to, and even over strength now, all ready fattened for the slaughter. We spent these days training. The problem in these trench battles is that the artillery preparation is so intense before an attack, that when we take the enemy's trenches, we find ourselves in an area of featureless mud and trenches. Everyone in the enemy's front line has been killed, but he has kept his reserve troops under cover, and they deliver a counter-attack two or three hours after our attack. Meanwhile our troops have not had time to construct trenches, and are driven out by the counter-attack . As a result, the latest theory is that sappers should follow immediately after our infantry attack, and dig defences and strong points instantly, to enable the infantry to resist the enemy counter-attack. This is what we are training to do. The fact is that making a line of defensive posts behind the advancing infantry is very difficult. It involves a great deal of work, and enough men are never obtainable. Moreover the enemy keeps up very heavy shelling, precisely to prevent you digging trenches before he makes his counter-attack. We were warned of an inspection of our mounted section by the G.O.C. of the division on 28 August . The drivers worked very hard for it, and were up half-way through the previous night. We waited on parade for two hours in the rain and then received a signal postponing it until the next day. The next night and morning, the same thing was repeated. We were all completely fed up . McQueen presented prizes and gave two francs to every man on parade. The first prize went to Driver Cannon and the second to Driver Christie. than ours, but their soldiers are extremely dirty and untidy, and rarely seem to salute. O.C. with Capt Mainghy RE, visited site of Strong Post in Mametz Wood and later with all Sections. Officers and training party from each Section started work and made preparations and collected materials for work on the 1st. C.E III Corps (Brig Gen Schreiber CB) visits camp 4 hours and approved plan and site of work. C.R.E (Lt Col Singer CMG DSO) visited camp. 31 August: Marched to Becourt. A bad march owing to the throngs of traffic on the main Amiens-Albert road, and to the fact that it rained continuously all day. The men have nothing but their greatcoats, which are too heavy and hot for a long march in summer, and their waterproof sheets, which keep you moderately dry from the shoulders to the hips, and wetter than ever below that. McQueen rode on and made me go with him, just before we reached Albert. We reached what appeared to be the map reference allotted to us to camp and found the 281st Army Troops Company there. So we selected a rain-swept sloping field next door, as the only open spot. Here McQueen. and I stood disconsolately, while the wind blew the rain down past us in sheets of grey, till the company arrived. There followed one of the most miserable nights I remember, everyone was wringing wet, with no cover but waterproof sheets, and lying on the muddy ground saturated with water. The last straw was when we discovered that there were two 8-inch howitzers in the valley just below us, which fired all night at three-quarters of an hour intervals. Each shot seemed to hit one in the face and wrap the whole bivouac in flame. We are bivouacked on the old British reserve line before the 1 July push. There are enormous numbers of guns here, 9.2-inch howitzers and 60-pounders stand in rows on all the hillsides. The sappers are making a cruciform redoubt in Mametz Wood. The infantry of our division is still out at rest and the sappers are working under the Corps. Coy during this period employed directly under C.E III Corps on making a "Strong Post" in Mametz Wood for a garrison of 1 infantry Coy. C.E III Corps visited on 2nd and 3rd (C.E. Brig Gen A.L.Schreiber CB DSO). C.R.E 50 Div (Lt Col C.W. Singer CMG DSO) visited Coy HQ on 3rd and 5th. All Sections employed on this work without Infantry working party.Site of work X 23.c.9.9. Sheet.57.D.SE -the work was of the Cruciform pattern, contained shell slits each with 2 entrances to accommodate 3/4 of garrison, 10 M.G emplacements arranged (with glades cut in the wood) to allow all round defence and flanking the wire on the front and flanks, Strong Post wired all around the work was completed (including revetment of all steps and weak places) by the 6th, except for the revetment of shell slits. On the 6th orders received that from the 7th, the Coy was to work again directly under C.R.E 50 Div. The 50th Div coming into the line in position between Martinpuich village and Highwood (both at this time in the hands of the enemy) relieving the15th Div. No 3 and 4 Sections were rested on the 6th. No1 and 2 Sections continued working on Strong Post until required for new work. On the 6th C.R.E 50th Div outlined programme for work during the next few days (such work being in preparation of a general attack) and preliminary reconnaissance and other arrangements were made for this work. (6' by 4') of which 3 dugouts 6' by 10' were to be located. To assist No 4 Sect in this work, 25 miners (7 N.F) was placed at our disposal, thus enabling 4 x 6 hour shifts enabling work to go on continuously. Excavation in the chalk was comparitively easy but in doing the gallery it was found necessary to keep walls timbered up to avoid falls in the roofing. No 1 Section (Lt Chaplin RE) was warned on this day for work of making 8 dugouts in Bethell Sap but the Sap not being at that time sufficiently deep the Section was rested. No 2 Section was marked for similar work in Jutland Str extension (sap) but this not being dug. (Lt Wade RE) was further employed on Mametz Wood S.P. 7-14 September: The sappers have taken over a job in the front line in front of Ba'zentin-le-Petit. We tried to take High Wood, just in front of .this part of the line, on 8 September, but failed. On the night of 11 - 12 September, Wade with No 2 Section, was making some shelters in Bethel Sap, in the front line to the left of High Wood, when they were nearly all gassed by gas shells. Some were sick, but most of them did not want to go back but were made to do so by the doctor. Corporals Martin, Maclaren and Rogers and one or two others survived. Sergeant Collings was sent back but returned soon afterwards and so did Wade. The other sections are making deep dugouts in a quarry in front of Bazentin-le-Petit, to take Brigade and Battalion Headquarters in the coming battle. They work in reliefs day and night, aided by some miners whom we have borrowed from the Northumberland Fusiliers for the job . The Boche are in High Wood, which commands all our lines. Our trenches are very deep and narrow, to give more cover from the whizz-bangs which, from High Wood, play fearful and accurate havoc on our trenches. The result is it is almost impossible to move along the trenches. It took Wade and his section two hours to get up the communication trenches ·to Bethel Sap. Our division has now relieved the 15th Scottish Division, who are rather demoralized by the shelling. On the right, the lst Division are very exhausted also, from making constant unsuccessful attacks on High Wood at huge cost . They have now been relieved by the 47th London Territorial Division. These look very clean and smart and march well. This front must have been a haven of rest before our attack on 1 July when the III Army were nicknamed the Deathless Army! Our camp is only 300 yards behind our old front line and is almost . without a shell hole. Becourt Chateau, about 1/4-mile from the old front line and in full view of the Boche, has only two or three holes in it. Compare Zillebeke ! I was standing in our bivouac one evening looking westward towards Becourt Chateau, about a mile away. The sun was setting behind the chateau and the western sky was a pale blue, flecked with light clouds. Shafts of golden light shot up into the sky, turning the little clouds into burnished gold. Between them one could see through to a piece of sky, very pale yellow, which gave an impression of gazing into eternity. And so, perhaps, I was for space seems to be endless and its significance known only to God . Under our conditions of life, it is impossible not to think sometimes of death and eternity. In Albert, the buildings are razed just round the church but elsewhere not much damaged. The church spire has a famous gilt image of the Virgin and Child on top of it, which is now leaning over at a steep angle. There is said to be a prophecy that, on the day the Virgin falls, the house of Hohentollern will do the same. The really marvellous thing round here is the number of guns. The bare shell-pocked hillsides are covered with rows and rows of 9.2-inch and 6-inch howitzers, 6-inch guns and 60-pounders. Another marvellous thing is our air superiority. Every day we have up to twenty-five to thirty-five kite-balloons in the sky, observing the Boche. Occasionally they put up three or four, but soon haul them down when our planes go over. No 1 Section (2Lt Chaplin) Bethel Sap not being sufficiently advanced to take dug outs the Section was put to making dugouts for a Battlion HQ. In small quarry by the cemetery at S.8.d.9.8 Sheet 57.C.SW 2 dugouts each 6 x 10 well sunk into quarry face with circular steel roof. No 3 & 4 Sections continued on Bde HQ making very good progress. No 2 Section rested. 2 Lt Wade reconnoitered Jutland Alley and sited bomb and ration stores. Work as for the 8th but 8 men were taken from Nos 1 & 3 Sections put on erecting a series of shelters S.E corner of Bazentin Le Petit Wood for bomb, ration and other stores. Lt Baker took direct charge of this work and also generally superintended of No 3n Section and dump of RE stores being formed by C.R.E at Pt. S.14 b. 9.9. No 2 Section excavated 6 out of 8 dugouts in Jutland Str extension and carried up roofing material. Work as for the 9th. 6 of the 8 dugouts in Jutland Str extension completed, remaining 2 excavated. Work as for 10th. No 2 Section (2nd Lt Wade) proceeding up Jutland Str by night were heavily shelled by all kinds of shells including mortar shells. This C.T was at the time guarded by infantry parties who suffered heavily and the consequent delay (the C.T being crowded) it took the Section nearly 2 hours to traverse the 1000 yds of trench.apparently some of the shells also contained phosphorus gas. In the dark this was not recognised. At Jutland Str many men of the Section complained of feeling ill. Although smoke helmets had been worn for sometime, about the same time large numbers of infantry were taken ill. 2nd Lt Wade decided it was best to withdraw as he saw no chance of getting useful work done that night. On arrival at dressing station 2 men in state of choking were admitted and M.O making further enquiries on condition of the men, he insisted on retaining a further 1 NCO and 7 men. On the following day 12th, a further 7 men taken ill and had to be sent to dressing station. The Section thus losing 1 officer, 2 NCOs and 14 men with others not fit for duty for a few days. Nos 1,3 & 4 Sections as on the 11th. No 3 Section completed Steel Sector dugouts of Bde Headquarters. No 1 Section completed Bn HQ also bomb and ration stores at corner of Bazentin Le Petit Wood. No 4 Section completed the deep dug outs except for portion of 1 dugout - very satisfactory performance. No 3 Section employed on work on road from "B.P" dump to the quarry. All Sections rested. Preparations made for work on 15th - day of general attack. The Company moved into dugouts at S.W corner of Mametz Wood (s.3.d.5.5) reaching there at 5pm and then men had good rest. The work during the previous 8 days was done under pressure and satisfactorily and reflected much merit on all Sections. 14 September: We marched up with the sappers to some dugouts behind Mametz Wood, so as to be handy for the show, which is to take place tomorrow .. We took section wagons with us, but most of the mounted section waited at Becourt. Zero hour is 6.20 a.m. Tomorrow. This afternoon was to me one of the rare occasions when the war has been dramatic and exciting. I was quite thrilled watching the long streams of troops and wagons pouring up the Mametz road. Then, all of a sudden, I heard a strange noise, accompanied by shouts and cheers, and saw the most extraordinary-looking vehicles approaching, with men sitting on them cheering. They were a kind of armoured car on caterpillars and each towed a sort of perambulator behind it. They are said to be the new assault wagons, called tanks. I don't know if the Germans knew about them, but the secret has been very well kept on our side. None of us had any idea of their existence. During the night, a high-velocity gun suddenly opened on our bivouac. Wheut-bang wheut-bang - wheut -wheut-bang-bang-bang! They were bigger than field guns and made deafening crashes. This was awkward, as we had the section wagon horses picketed outside. I yelled, 'Stand to your horses', and the drivers turned out with alacrity. Fortunately our horses are used to shellfire, they only give a plunge when a nearby explosion frightens them. It was shivering cold and dark and I felt a bit scared, Next morning in the semi-dusk, all the landscape was utterly silent and still. Then, all of a sudden, pandemonium burst. The hills were everywhere lit up with the darting flashes of the guns and the noise was deafening. I was quite thrilled. Under CRE 50 Div. Open Order No 3 df 12/9/16 The Company (less remains of No 2 Section who were employed as orderlies and other duties) left camp 5.30 am and proceeded with 2 Platoons (C Coy) 7 D.L.I (pioneers) to work from about "zero hour" of attack 6.20 am on the road from Pt.S.14.b.1.7 (Sheet 57 B SW) through village of Bazentin Le Petit and thence heading to High Wood (N.W Corner) The attack commenced at zero hour the 50 Division attaining its objectives viz, line running from N edge of Martinpuich village to about 500 N of Highwood, both of which localities who before the attack were in the hands of the enemy-as anticipated up to 12 noon the work on the road was but little disturbed, after 12 noon a good deal of 5.9 and 4.2 shelling on Bazentin Le Petit village. Work continued till 1 am, with a break from 1pm-2pm for rest and food and then till 6pm - all Sections as with Pioneers worked excellently. The road was, in the village, a series of long shell craters but with use of 4 forage carts, 2 hand carts, 20 wheel barrows and with plenty of hide to hand, a passable road was made as far as the X roads immediately N of Bazentin by 2pm, and at 6pm a track had been cut (down to road existing metalling) to a point 400 yds on the High Wood Road. The 1 N.F took on the work at 6pm. Then Company returning to dugouts. A very satisfactory days work. 15 September: One of the chief problems of these big attacks is that the infantry go forward, leaving behind them a belt of country two or three miles wide, which consists solely of soft, spongy mud, churned up by endless shell bursts, and crossed by no roads or even paths. No sooner have the infantry gone forward a mile or so than they begin to call for ammunition, rations , barbed wire, sandbags and other requirements, while the' wounded somehow have to be got back. As a result, it is absolutely vital to make some sort of roads forward just behind the infantry, so that wagons can get up to near the front line as soon as it is dark. Moreover, if the infantry have gone forward a couple of miles, the guns have to be rushed forward also, in time to support them when the enemy counter-attack is launched, perhaps four or five hours after our attack. The enemy having gone back, his guns are close to his infantry, while our guns are two or three miles too far back. Thus the guns and ammunition limbers have also to be moved forward in those precious four hours after Zero. All this great amount of traffic - infantry stores, guns and ammunition - have to be transported over a two-mile belt of country, consisting of a uniform muddy porridge, from which all features - roads, trees, buildings and villages - have been obliterated. This is our job today. The sappers and their forage carts left at 6 a.m., to mend the road from Bazentin-le-Petit to High Wood, as soon as the latter should be taken. I had to sit all day in Mametz Wood, in case messages came in for company headquarters. The sappers were not disturbed for the first few hours, as the enemy guns were concentrated on our infantry. In the afternoon, a fair number of shells came over, but we only had three men hit. Prisoners kept coming down in batches all day, and the air was electric with rumours of victories. We took all our objectives, but High Wood again proved a hard nut to crack, and cost the 47th Division a lot of men. It was only taken because the troops on either side of it went forward past it and left it behind. There seem to be two opposing theories on the subject of major attacks on a wide front, like that of 15 September on the Somme. One theory wishes to take in advance all the enemy 's strongest points - like High Wood - by means of local attacks, so that nothing will hold up the main attack. The opposite theory is to do nothing until the main attack . Then, by breaking through the weak places and going forward, we leave the enemy's strong points behind us, and eventually force them to surrender. Those in the front line, who had seen the losses incurred trying to take High Wood, were convinced that the second theory was the right one. And indeed soon after the 15 September attack, an instruction was issued by G.H.Q. adopting it.The sappers worked all day and all night of 16 and 17 September, together with the lst and 2nd Northumbrian Companies. They have been carting bricks from the ruins of Bazentin-le-Petit, to fill shell holes in the road up to High Wood. We are using all our wagons, including the pontoon wagons fitted with improvised bodies. I hear we took Martinpuich and Courcelette on the 15th, which was good. We ought to attack again immediately to try for a break-through. The cavalry have suddenly appeared at Fricourt. The German line is still intact, but two miles further back. The guns are all now moving forward, but have not got up fast enough to enable us immediately to attack again and maintain the momentum of the advance. Company marched at 5pm to take over work on James Road from the 2 Northumbrian Field Coy RE. Working party, 75 of A Coy 7 D.L.I.Work commenced from Pt. S.3.c.3.3 to taken as far as Pt.S.3.c.9.4. The portion was mainly very bad owing to a trench lining been cut along it. 2 casualties enemy shelling of the X roads at N end of Bazentin Le Petit village. Somewhat delayed the bringing up of material. The cutting was widened by 3' to allow 2 way traffic through it-work till 6 am 17/9/16. 17-19 September: The weather has been bad for the last two days and has made the operations much more difficult. Just two days after the attack when the infantry were done to the world under constant fire and had neither time, men, stores nor energy to dig in properly, the weather broke. On the 18th, it poured all day, and the north wind made the cold bitter. The troops up the line looked as if they had been dipped in a swimming bath. Their sodden khaki, looking almost black, clung to their bodies all over like wet bathing dresses. I should think many must have died of exposure, lying out in shell holes, for the rain kept on all night and most of the 19th. Captain Boast, O.C. 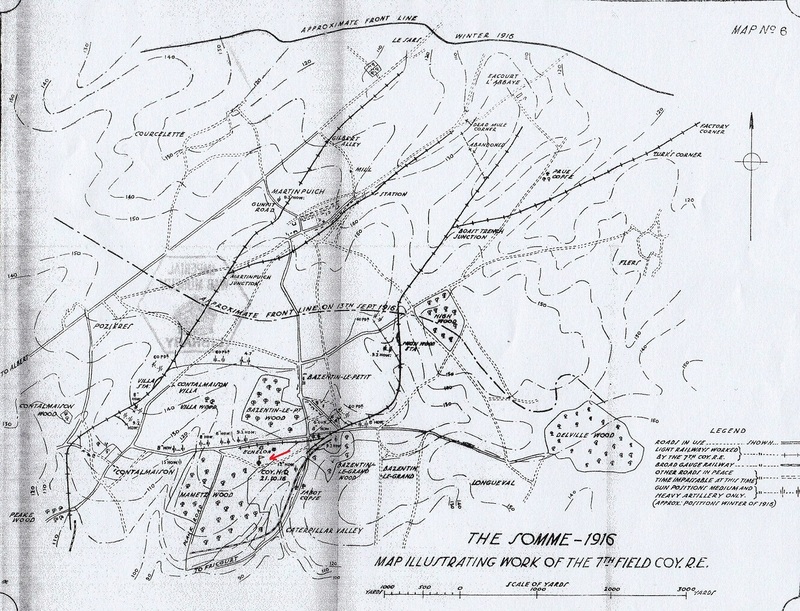 of the lst Northumbrian Territorial Field Company R. E., dug a trench on the night of the 18- 19 September, connecting·the right flank of our division with the left of the 47th Division, where there had been a gap since 15 September. Div H.Q. were very pleased and the trench was called Boast Trench. He could not reach the site by daylight as it was on a bare forward slope close to the Boche. So he had to mark it but at night with a prismatic compass, working from the corner of High Wood, about 200 yards from the enemy. He is a nice quiet little man, and will probably get a Military Cross for the job, which no one will begrudge him. The Chief Engineer of the Corps came round today. He was very pleasant and how-are-you-my-dear-boy sort of thing. Before him, the Army C.E., General Buckland, had come to see us. He said he had known Dad in South Africa, when the latter was commanding the 17th field Company. The roads are very bad all the way back to Mametz after all this rain. On the night of the 20th, Reilly, with the G.S. wagon with rations, took twelve hours to cover three miles, owing to the mud on the roads and the packed traffic. Wade came back last night, as being cured of his gas. He and I stayed in the bivouac when the company went out to work on the night of the 2lst . He was all right at dinner, but when we had gone to bed, he came to me saying he felt ill. He soon got worse, felt very sick and could not breathe, so we took him down to the dressing station on a stretcher. I am afraid he has gone for good. At 10 p.m. I got a signal from the C.R.E. to send an officer to meet an infantry battalion at 7 a.m. to clear the Contalmaison -Bazentin road. As I had no officers, I went myself, and met the 5th Durhams, and set them on the work. In the afternoon, I reconnoitred the Bazentin - Martinpuich road. It was very difficult to find the road across the waste of shell-holes and mud, as the road itself had been completely covered by earth. On the 22 July the Division side - stepped to the sector Spanbrokmolen - Wulveghem. This was the sector in which the Company had been in June 1915, but now had the reputation of being a quiet spot and a “fattening area” for the Divisions destined for more arduous work. Owing to the ground falling away from the front line to a distance of 1,500 yards, conditions were very different from what they had been at Wytschaete. It is possible to work all day and actually to bicycle or ride up to the support line on daylight. The line was again mainly breastwork and the work consisted in strengthening and improving works. Trench mortar activity was very marked on both sides and the work was repeatedly destroyed by enormous German minnenwerfer. These made craters nearly twenty feet across and the whole support line area was indented with them. Fortunately no casualties were incurred from this cause as the minnenwerfer were usually sent over at night. A strenuous effort was made by infantry battalions to develop an organisation for works and an innovation was made by attaching a Sapper officer to act as liaison officer with the Brigade. This officer gave technical advice and assistance from a small RE party of eight sappers detailed for the purpose, and arrangements was particularly valuable in ensuring continuity of work and effort by the front line battalions. The Company handed over on the 6th August and marched at dawn on the 8th to its previous billet in Mont des Cats and spent two days in training. Second Lieutenant Glubb rejoined on 9th August and took over the duties of acting captain. Entraining at Godvaersvelde on the 11th August, the Company detrained the following morning at Candas, five miles south west of Doullens and marched to Boisgergues (6 mile) where three wet days were spent in bivouac. The Company always carried out one 3’ stick per man, with a nail in one end and a length of spun yarn attached. Four of these and four ground sheets made an excellent bivouac for four men. On the 15th the March was continued to Wagnies (13 mile), on the 16th to Mirvaux (9 mile), on the 17th to Franvillers (12 mile) where 12 days were spent in training. Leaving Franvillers on the 30th , the Company marched to bivouac near Becourt (10 mile), three mileseast of Albert. 1st - 6th September, making a double Company strong point for all-round defence in Mametz Wood. This work was a cruciform pattern, containing revetted shell slits (each with two entrances) to accommodate most of the garrison and emplacements for machine guns firing down glades cut in the wood, with all round and flanking wire. No infantry working parties were available, the work being carried out and completed by the four sections of the Company. During this period, billets were moved from Becourt to dugout shelters at the south west corner of Mametz Wood. 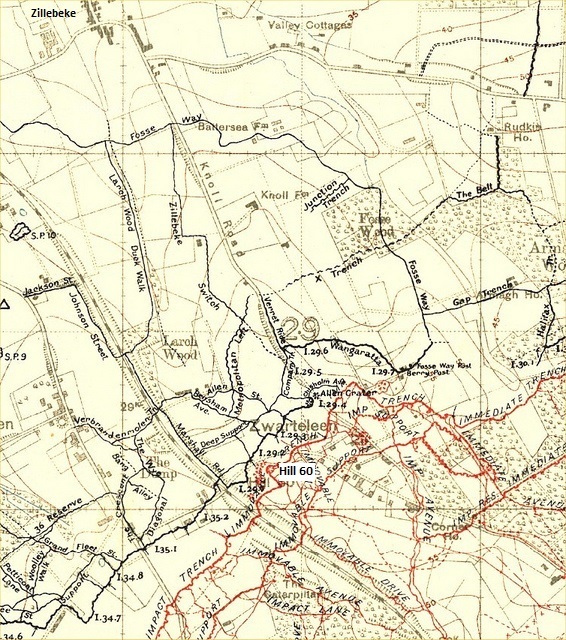 7th to 14th September, work in preparation for the general attack of the 4th Army, namely, large mined dugouts for the Brigade and, later, Divisional Battle HQ in a quarry near Bazentin-le-Petit (completed by continuous day and night shifts), protected shelters for dressing stations in the same quarry, splint proofs in forward saps, a regimental aid post in Jutland street C.T. trench. Steel sector dugouts for a Brigade HQ, bomb and ration stores at the south corner of Bazentin-le-Petit Wood, road work. 15th - 26th September: On the 15th the general attack took place, zero hour being 3. Am, with orders to repair the road up to and through the Bazentin-le-Petit village (I mile), then a mass of debris and large shell holes, and thence to remake the old French third class road leading to the west corner of High Wood (1 ½ mile). As the ground was entirely shell torn, it was necessary to dig throughout to find traces of the road, which had formerly consisted of 6” of chalk with little or no metal. Work was commenced at 6.30 am and by 1pm the road was completed as far as the crossroads north of the village (1mile). The ruined houses giving a plentiful supply of brick for filling in shell holes. During this time the village was shelled intermittently. The parties were rested and fed from 1-2 pm, when work on a second road sector was commenced and carried until 6 pm, by which time 570 yards had been opened up (with much digging) and 300 yards had been completed, with shell holes bricked. Six (specially boxed) trestle and GS wagons were used for the work. During this time the enemy still held High Wood, but was too closely engaged to pay much attention to working parties. The work was intermittently shelled with remarkably poor 4.2” shell and only four casualties resulted, although the wagons had to gallop through the northern corner of the village in order to avoid shells bursting at regular intervals at this point. Fortunately the intervals were so regular that it was possible by careful timing to ensure a clear passage. One officer, sitting on a wheel barrow, was blown head over heels off his perch without, however, suffering anything worse than a nasty shock. During this work the British tanks were seen in action for the first time, but they had little chance in High Wood, where two were “bellied” on shell torn tree stumps. At 6 pm the 1st Northumbrian Field Company took over the work till 6.am on the following day (16th), when the 2nd Northumbrian Field Company followed till 6.pm., being succeeded in turn by the well rested 7 Field Company till 6.am on the 17th . By this time the road was virtually complete as far as High Wood. (Captured on the 15th / 16th) and had been extremely used on the 16th by the 50th Division artillery moving up in close support to fresh positions. The 18th /19th were spent in widening the road and its cuttings to take two way traffic more readily and in adding brick and metal throughout. The weather was wet and the thin chalk soling (invaluable during the first 48 hours of the battle) soon started to give out. The C.R.E. had arranged for large quantities of metal and its carriage to the site of the work in D.A.C. wagons. The whole length to High Wood was heavily metalled by the 20th, by which time forward dumps of all sorts were formed on the near side of the High Wood ridge. 21st -30th September: On the night 21st /22nd , three sections of the Company, with one platoon of 7 D.L.I. Pioneers, completed a large strong-point (Vaux Post), 400 yards north of High Wood and clear of any marked features. This “post” was designed for all-round defence by a garrison up to one Company, with revetted shell splits, open machine gun emplacements, and 450 yards of double French wire and double barbed wire apron (150 coils of barbed wire used). Special measures were taken to secure its concealment from enemy aeroplanes. It was sited in conjunction with two similar works on the 50th Division frontage, the important High Wood position being thus effectively consolidated some 800 yards behind the advanced infantry, who hastily dug themselves in stage by stage as they advanced. Only a few casualties occurred in the construction of these posts. On the night of 21st a reconnaissance was made for 60cm steel tramline to run down the forward slopes of High Wood ridge in the direction of Eaucourt l’Abbaye, to connect the newly-constructed road with the advanced infantry. The construction, maintenance and control of this line now became the Company’s chief work and is interesting both from a tactical and a works point of view. Traversing ground in direct view of the enemy, its construction was only feasible at night, though small maintenance parties worked by day. The ground was thoroughly shell torn and the work of layout and leveling, the accuracy of which was important to allow of immediate use and subsequent tractor draught, was necessarily rough and ready-bayonets in shell holes by eye and at night being the substitute for line levels. The enemy whizz banged the work at intervals but only occasionally checked it. Work commenced on the night 22nd /23rd, (7 pm to 5 am), a Company of the 7 D.L.I. Pioneers working with three sections of the 7th Company. Records of the nights work show 700 yards taped, 350 yards formation prepared,150 yards rail laid, further 150 yards rail carried to site. Casualties, one NCO killed and three men wounded. By the 28th September 1.400 yards of line were completed and in full use for hand pushed tracks as far as Prue trench. During its construction the line was used by the infantry for bringing up rations, ammunition etc, and it also served as an easy track through the wilderness of shell holes, disused trenches, wire, etc. This greatly impacted the work, but its value to the infantry as a track was so evident that its use as such was permitted. It necessitated trench-boarding throughout at an early stage. Had this difficulty been foreseen, the simultaneous construction of a trench board track some distance from the tram line would have been advisable. By the 2nd October, when the 50th Division was relieved by the 47th Division the line had been extended beyond Prue trench to its next and final objective, a point on Martinpuich-Eaucourt l’Abbaye Road, 2,400 yards from its starting point, the last 1,000 yards having been swung round roughly parallel to the outpost system, thus affording convenient dumping points a few hundred yards in rear of that system. The work naturally attracted a good deal of attention from the enemy and the casualties incurred in its construction was considerable. Thus on the 25th the daylight maintenance party lost by shell fire: Engineers two wounded, infantry, one killed, five wounded, and on the night of the 30th by rifle and shrapnel fire, Engineers two wounded, infantry two killed, five wounded but in a military sense the casualties incurred were not heavy in view of the essential nature of the work, without which the advanced infantry could only with great difficulty have held their hardly-won positions. Sergeant Collins DCM, No 2 Section was severely wounded on this work on the 30th by a bullet in the abdomen. His strong and cheerful personality, devotion to duty, to sports and to all that affected the welfare of his section and the Company made his loss greatly felt. He had come out with the Company in August 1914, and throughout these two years had shown unfailing cheerfulness and marked courage. The total 7th Company casualties during the operations 15th September to 2nd October were 29, Viz one officer and 16 other ranks gassed, 12 other ranks wounded. The gas casualties occurred on the 11th September during the preparatory phase, when 2nd Lt Wade and No 2 section were attempting to proceed along a narrow and congested C.T., then being heavily shelled. Some of the shells contained phosgene gas, whose presence was not at once detected and gas helments were not put on till sickness occurred. 2nd Lt Wade, two NCOs and 14 men then thus became casualties, but most were soon back on duty. The infantry also failed to recognise the presence of gas and suffered correspondingly. After this first experience of gas shell, early adjustment of helmets became customary. Special work on III Corps light railway in the Somme area 17th October 1916 - 29 January 1917. O.C. 7 Field Company RE. Now that the 7 Field Company RE is shortly leaving this Division, I wish to take this opportunity of bidding farewell to the Company and of thanking all ranks most heartily for the manner in which they worked under my command during the past 15 months. During this period the Company has constantly earned ungrudging praise from the G.O.C. Division and from the G.O.C. Brigade to which it has been attached. The work of the Company has always been carried out with cheerfulness and efficiency during often very difficult times, more especially in the spring of this year and during recent fighting here. No task has been too hard, nor have difficulties ever been raised. I am proud to have a Company with such a record under my command and how I can only deplore the fact that for good of the service it has been found necessary to take you away to other work, and most heartily congratulate you on being selected out of the Field Companies of 4 Divisions for this special work. Will you please pass on to all your officers and to all ranks of the Company my warmest thanks for the past and my good wishes for the future, with the hope that you may soon return to the 50th Division. The employment of a Field Company on work of this nature was somewhat unusual. A permanent working party of 1,450 strong, was attached to the Company, with five officers selected on account of previous railway experience. This party was known as 7th ‘B’ Echelon and consisted of four platoons of Pioneers, four platoons of infantry and fifty gunners furnished from each unit of each Division of III Corps, a somewhat heterogeneous crowd at the start. They, however, soon settled down to a most efficient body and relations with the sappers were most cordial. The work consisted of extending the tramways as far forward as possible and rearwards to join up with the railhead. The tram lines joined up with the broad gauge railheads at Bazentin (Langland Circus) and Peake Wood. The main lines were (1) Bazentin- High Wood, Eaucourt l’Abbaye with a branch to Turk’s Road and Factory Corner, and (2) Peake Wood-Martinpuich with two forward branches. By the end of December the total mileage was 24. The work was interesting, regular and at times, sufficiently exciting, as the main lines went over a ridge in full view of the enemy and down a long forward slope. In order to obtain the maximum output from the system, regular train services were run with petrol tractors to draw the loads as far as the enemy would permit. The working of these time tables and control of the rolling stock were in the hands of traffic officers attached to the Company, and living in dugouts at High Wood, Peake Wood and Villa Station. Maintenance parties for repairing breaks in the line, which averaged 3-4 per day, had to be maintained along the line in addition to the regular maintenance gangs employed on ballasting and extending the lines. One very serious trouble was caused by the use of the track by all and Sundry as a road. the spaces between sleepers were at times almost knee deep in mud. As there was no other way up to the front the trouble could not be prevented or cured. This was done by Captain Glubb’s idea of putting down poling boards or rough planks between the rails. On one occasion about 27 mules of a string of 100 belonging to Canadian gunners were killed alongside the line at the top of the ridge above Martinpuich. As no one could bury them they became somewhat embarrassing, and the assistance of a very high authority had to obtained to get them removed. On the right sector the line in front of High Wood was worked by pushing, as it was not fit for tractors and was in full view of the enemy, who frequently shelled it. On the left sector, engine ran fairly regularly to gunpit road and Martinpuich Station, but in clear weather, the train could not cross the ridge owing to sniping by whizz bangs. The part forward of gunpit road was so exposed that the infantry preferred to carry stores up Bapaume road. The enemy used to fire machine gun bursts along at night. Nevertheless, it was ballasted throughout by Littlewood and No 2 Section working at night. The Camp with its workshops, sidings on the main line etc, and the presence of a 12” gun on a railway spur attracted unwelcome attention at times from 13.5” gun. The first vibration of a shell from this gun completely destroyed the Company incinerator, together with two men working at it. It was thought at the time that the incinerator was placed on a dud shell as this particular gun could not be heard. The incinerator and men simply disappeared. When, however, another shell arrived on the Company “parade ground”, making a large crater and covering the huts with enormous clods of frozen earth, the truth was realised. Second Lieutenant C.W.S. Littlewood joined the Company in October. The Company mess at that time was in an old gun pit, just in front of rows of all kinds of guns,, and his entrance to the mess was marked by a salvo of 60 pounders, which literally nearly lifted the roof off the mess. Work continued on tramline. No 1 Section by day levelled off track (cut the previous night by No 2 Section) from railhead now at Cardiff Trench as far as the extension of the Therford Alley beyond Prue Trench. No 2 Section on night 29/30 carried the track on for 300 yds to Pt. M.28.c.4.6. No 4 Section bridged extension of Ratherford Alley and prepared for laying tramway track.unfortunately 2 expected trucks of rail failed to arrive till 5 am on the 30th - had rails been available the rack on this date would have reached beyond Prue Trench. No Casualties. Work on tramline - No 3 Section with infantry working party worked on improving existing tracks by day and erecting of track to point M.28.c.4.6. - 1 NCO and 3 sappers wounded - No 2 (Lt Baker) and 70 men works party carried on track preparation as far as within 100 yds of objective on Martinpuich - Le Sars Road - intermittent bursts of HE shrapnell caused following casualties; Sgt Collins severely wounded, 1 sapper wounded and in works party 2 killed, 5 wounded. The work was thereby interfered with and much progress was not made. On dismissal of Inf works party No 2 Section assisted No 4 Section engaged in rail laying. Rails were laid to a point from Starfish Trench - Prue Trench (420 yds) rails laid but not jointed for 100 yds beyond Prue Trench. Total 1550 yds of tramway laid since 23rd. No 2 & 4 Sections returned camp 6.30 am. 1/10/16 Sgt Collins DCM loss to his Section is great. He served with the Coy in the field since August 1914 with distinction. While many WW1 engagements along the Somme have largely been forgotten, the action at Courcelette, or Flers-Courcelette as is often known, remains an important milestone in military history. It was here on 15 September 1916 that the tank was first used in warfare, and the shifting fortunes of that confused day of battle continue to be studied by armour experts to this day. Orders received - in the morning to make strong wire round Strong Post (Vaux Post) sited immediately N.W of High Wood. The 3 available Sections (1,3,4) with 25 D.L.I. were employed on this. Work commenced 7 pm, 450 yds double trench wire with double barbed wire apron was completed by 3 am 22/9/16. Inst- barbed wire calculated at 120 coils was sent up but this proved insufficient, another 30 coils for loose wiring would have improved the work, but the entanglement was quite "strong" without it. Coy rested for remainder of 22nd. Lt Baker under instruction of CRE, revisited a line of tramway to run from Pt: on High Wood - Martinpuich Rd about 300 yds distance. From High Wood almost due N, to continually run far N, as Prue trench ( the advanced trench). 2nd Lt Glubb recced Bazentin Le Petit - Martinpuich Road with view to road repair and his report forwarded to CRE. Line selected for tramline from point above mentioned (S.3.b.5.5) to Prue trench (Pt.S.34.a.10.7) distance 1,400 yds. O.C and Lt Baker taped out 700 yds of this line. About 300 yds of tramline brought up to rail end during the day. No 3 Section (Lt Thompson) with 10, 9 D.L.I. works party laid 160 yds of line, No1 Section (Lt Chaplin) with 100 men W.P from 9 D.L.I. cleared 350 yds of track across ground much broken with shell holes - the work was shelled with Whizz Bangs pretty consistently, and carried on with some disruption. Casualties: 1 NCO killed, 2 wounded (all of works parties) 1 RE wounded - Parties returned okay at about 5 am. 23 September:The Boche has retired a little way on our Corps front and we have temporarily lost touch. We were above him on a forward slope beyond High Wood, and he doubtless did not like to remain overlooked. We cannot immediately follow him up, as the country sloping down from High Wood to Eaucourt is simply a wilderness of shell-holes almost impossible to cross and is in full view all the way. Not a fly can cross the High Wood ridge without being seen by the Boche. The whole country is rolling downs, looking in the distance like a ploughed field,·but in reality a continuous series of shell-holes and mounds between them. The area is thickly dotted with specks of black and grey, lying motionless on the ground. When you approach, the black patches rise into a thick buzzing swarm of bluebottles, revealing underneath a bundle of torn and dirty grey or khaki rags, from which protrude a naked shin bone, the skeleton of a human hand, or a human face, dark grey in colour, with black eye holes and an open mouth, showing a line of snarling white teeth, the only touch of white left. When you have passed on again a few yards, the bluebottles settle again, and quickly the bundle looks as if covered by some black fur. The shell-holes contain every debris of battle, rifles, helmets, gas-masks, shovels and picks, sticking up out of the mud at all angles. One cannot see these ragged and putrid bundles of what once were men without thinking of what they were - their cheerfulness, their courage, their idealism, their love for their dear ones at home. Man is such a marvellous, incredible mixture of soul and nerves and intellect, of bravery, heroism and love -it cannot be that it all ends in a bundle of rags covered with flies. These parcels of matter seem to me proof of immortality. This cannot be the end of so much. Work of squaring up the line already laid, cutting drains and improving track already cleared, bridging Hook Trench, starting to bridge Boast Trench, was carried out by 1/2 of No 3 Section (Sgt Bones) and No 4 Section (Lt Slattery) from 6am-5pm. 1/2 No 3 Section and No 1 Section continued work from 7 pm as on previous night. Rails laid as far as a point 80 yds short of Boast Trench, track carried on to Starfish Trench. Enemy barrage in neighbourhood of Starfish Trench by night causing a few casualties to work parties but work resumed in intervals. Owing to misty day the day work superintended by 2nd Lt Baker was quite undisturbed. Strong reinforcements (18 men) now received for No 2 Section, which formed loading and unloading parties for rail. On 25th day party marched and shelled suffering casualties: 2 RE wounded, 1 man killed, 6 lightly wounded. 24 September: It seems hopeless to overtake the front line by building roads across this vast waste of mud. The latest idea is to lay down a hasty 'decauville' light tramline, from the left of High Wood towards Eaucourt L'Abbaye. The company has stopped work on the roads and is to lay these tramlines. This, however, presents me with a new headache, for we have to carry the tramlines on our wagons from Becourt to High Wood. The big gauge railway has now been laid up to Becourt, where the guns were a week ago! Half a mile of big gauge railway was laid in forty-eight hours, and the trains began to run before the line was ballasted. 25 September: I rode back to our mounted section lines at Becourt and loaded up the trestle wagons with tramlines, and took them up to High Wood after dark. 14th Corps (Lord Cavan), on our right, took Lesboeufs, Morval and Guedecourt today. Work carried on tramway as on 24th. Progress rail head carried to Pt. S.34.c. 6.6 (250 yds beyond Boast Trench) and track cleared as far as Prue Trench. 26 September: Took some trolleys and sleepers for the tramline up to High Wood. This decauville 60-centimetre gauge track is complete with sleepers and is supposed to be laid down all ready-made, and just bolted together. In practice, however, some of the sleepers and bolts are always missing, and a good deal of improvisation is needed. It is curious from the ridge beside High Wood, standing on an expanse ploughed up in shell-holes and strewn with rifles, helmets and corpses, to see only two miles away a peaceful landscape of downs, leafy woods, and the church steeple of Le Barque showing above the trees. This country had been out of range of our artillery until week ago. However it is now within range and already the copses in front are becoming smashed and stripped. Soon all the trees will have disappeared, as' in High Wood, leaving only an occasional splintered trunk standing, and a debris of split, tom and rotting timber on the ground. As you stand looking at this view, you hear the continuous quiet wheu-u-u of our big howitzer shells, which seem to spring up from the horizon behind you - or the lightning wheut of the whizz-bangs flying past -followed by a sudden volcano of grey on the distant hills, or the little white puffs of shrapnel among the trees. By what tortuous build-up of evil have men become such tragic and cynical destroyers of their fellow beings, and of the glorious beauty of nature? Madame Cheale, Sentier de l' Eglise, Nieppe. Work continued on tramline, under CRE's instructions the line was to be extended over Prue Trench in N, or N.W direction with objective Pt: M.28.a.3.4 on Martinpuich - Le Sars Road - O.C and 2nd Lt Baker reconnoitred this extension and taped 400 yds of it. As no rails were received at Becourt Stn sidings on this day, No 4 Section (detailed for rail laying) joined No 2 Section (2nd Lt Baker) in preparing 300 yds of this track from a point 200 yds beyond Starfish Trench. 100 men (6 NF) working party worked on this sector. 5.9" shells were dropped at irregular intervals about 70 yds from works party and in one period 9 - 9.30 pm it was found advisable to withdraw works party on this account - only casualty 1 sapper with shell shock. No 3 & 1 Sections rested. Right: 'U' frames uncovered by an archaeologist trench dig in the Ypres area. After 90 years they are still in good condition.